Jacket zipper, 2-way, plastic, 6 mm wide, 100 cm long. Jacket zipper, 2-way, plastic, 6 mm wide, 95 cm long. 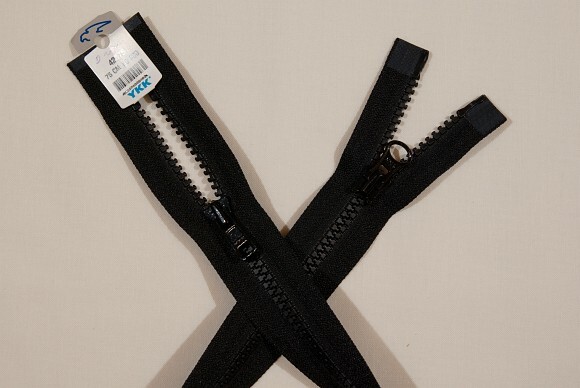 Jacket zipper, 2-way-dividable, plastic, 6 mm wide, 90 cm long. Black jacket zipper, 2-way-dividable, plastic, 6 mm wide, 85 cm long. Black jacket zipper, 2-way-dividable, plastic, 6 mm wide, 80 cm long. Black jacket zipper, 2-way-dividable, plastic, 6 mm wide, 75 cm long. Black jacket zipper, 2-way-dividable, plastic, 6 mm wide, 55 cm long. Black jacket zipper, 2-way-dividable, plastic, 6 mm wide, 65 cm long. Black jacket zipper, 2-way-dividable, plastic, 6 mm wide, 70 cm long.